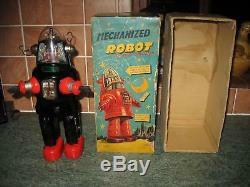 "PRESENTS" coupon runs out this evening... SPACE AGE SCIENCE FICTION ROBOT. 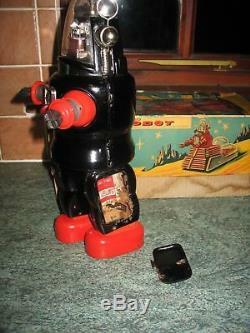 CLEARLY BASED ON "ROBBY" THE ROBOT, OF THE 1956 CLASSIC SCI-FI FILM "FORBIDDEN PLANET". GREAT IMAGERY ON UPPER BOX LID. 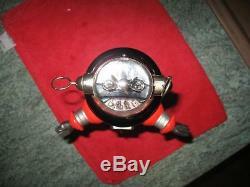 EARLIEST VERSION WITH SMALL ROUND BATTERY DOOR KNOBS/HANDLE. I'VE JUST HAD HIM AS A NICE SHELF DISPLAY... 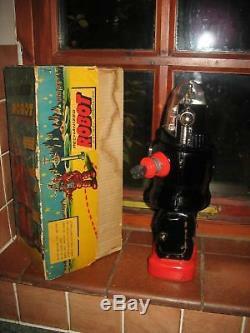 THIS GREAT OLD TOY IS NOW OVER HALF A CENTURY OLD, WITH DELICATE INTERNAL CONNECTIONS/COMPONENTS.. I WILL PACK VERY CAREFULLY, AS I ALWAYS DO...... BUT THERE IS NO WAY OF KNOWING HOW THE TRAVEL IN THE POSTAL SYSTEM MAY AFFECT ANYTHING..... WITH NO GUARANTEE OF FUTURE FUNCTIONING. Purely as a courtesy to a number of requests, i did briefly put some batteries inside..... 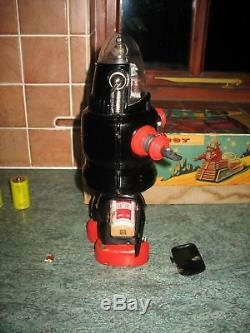 The head pistons were going up and down, and the antenna were turning. PLEASE TRY CLICKING ON THE FOLLOWING VIDEO LINK, TO SEE A SHORT CLIP OF ANY WORKING FUNCTIONS. I HAD TO PACK OUT THE BATTERY CONTACTS WITH LITTLE SILVER FOIL TO MAINTAIN CONSTANT CONTACT.... Due to worn contacts etc... 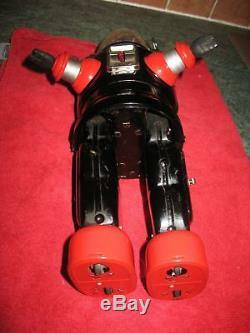 ROBOT IS NOW AROUND 60 YEAR OLD SO DOES SHOW TYPICAL AGE/PLAY WEAR, MARKS, SCUFFS, CHIPS ETC.. AS CLEARLY SHOWN, OLD ROBOT DOES HAVE OXIDATION/CORROSION, MAINLY AROUND THE BACK OF HIS LEGS AND IN BATTERY COMPARTMENT AREA WORSE IN LEFT LEG COMPARTMENT... WITH LOSS OF METAL/DAMAGE TO HINGE, ALTHOUGH DOOR WILL CAREFULLY SLIP IN POSITION AND SHUT. FEW PAINT FLAKE/CHIPS AT REAR BODY... WITH EXPECTED AGE/WEAR & TEAR;INCLUDING THE UPPER LID WITH ONE END MISSING;ALTHOUGH I DO HAVE A MAJOR PORTION OF A SIMILAR END PIECE TO INCLUDE. 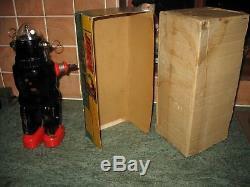 SHOWS VERY NICE SPACE/SCI-FI RELATED IMAGERY.... LOWER BOX WITH STAINING, WEAR AS SHOWN ETC.. RETAINS THE ADJUSTABLE ARMS, WITH THEIR BLACK RUBBER "GRASPING CLAWS". WEARS TRANSPARENT HELMET, WITH ITS LITTLE SCREW FASTENER AT REAR. NICE BRIGHT APPEARANCE ON DISPLAY... Especially as most of the oxidation is to the rear. 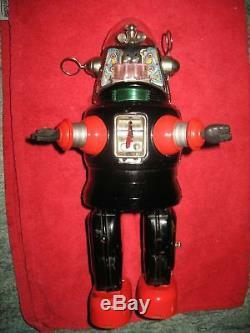 THIS IS AN ORIGINAL 1950'S "ROBBY" ROBOT;AND NOT ONE OF THE COMMON / MODERN OSAKA REPRODUCTION EXAMPLES FROM AROUND 20 YEARS AGO. NOW AROUND 60 YEARS OLD.... 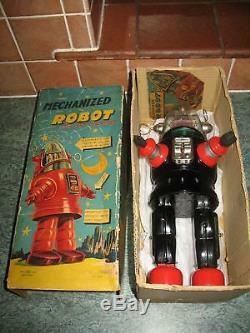 STILL LOOKS GOOD DISPLAYED WITH IT'S RARE OLD BOX. I'VE ADDED ALL THE IMAGES I CAN, TO HOPEFULLY SHOW THE HONEST/ACCURATE CONDITION... PLEASE TAKE A GOOD CLOSE LOOK FOR YOURSELF, AS THESE PICTURES ALSO FORM PART OF THE DESCRIPTION...... 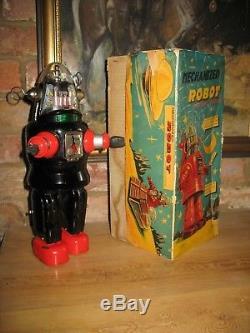 The item "NOMURA MECHANIZED ROBBY ROBOT & BOX TIN PISTON JAPAN TINPLATE VINTAGE SPACE TOY" is in sale since Monday, November 19, 2018. 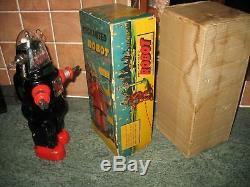 This item is in the category "Toys & Games\Vintage & Classic Toys\Robots & Space Toys".